This evening, a short departure from our usual recipes to something a little more liquid in its nature. While making pizza for dinner, I found myself with about 125ml of Pineapple juice (from small can of pineapple rings). So naturally I thought I shouldn’t waste perfectly good juice and therefore set about devising a suitable way to make use of it. The result is The Land Downunder cocktail. Named thusly for its upside down colour arrangement (blue = sky, green = vegetation, yellow = beaches). Put all ingredients EXCEPT the Blue Curaçao in a cocktail shaker. Shake well. 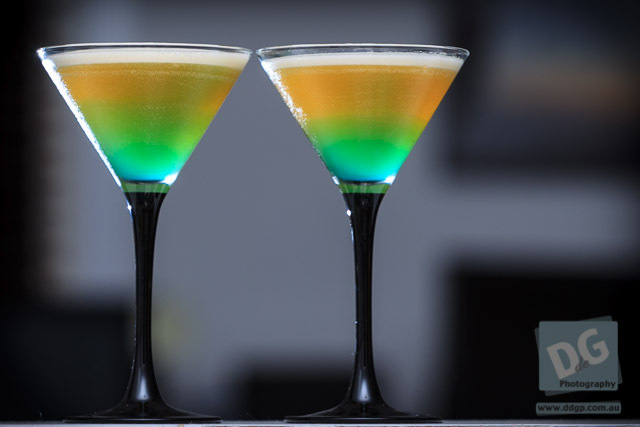 Pour in to two martini glasses and then drizzle some blue curaçao in so it settles on the bottom.